Saint Peter, a fi sherman from Bethsaida and one of the first followers of Christ, was made the chief of the Apostles by Christ, who changed his original name, Simon, to Cephas (rock). Peter denied Christ during the passion, but later proved himself worthy to be the Vicar of Christ on earth. presiding in turn over the Church in Jerusalem, Antioch, and Rome, he suffered martyrdom in Rome in the year 67 A.D. by being crucified head downward. 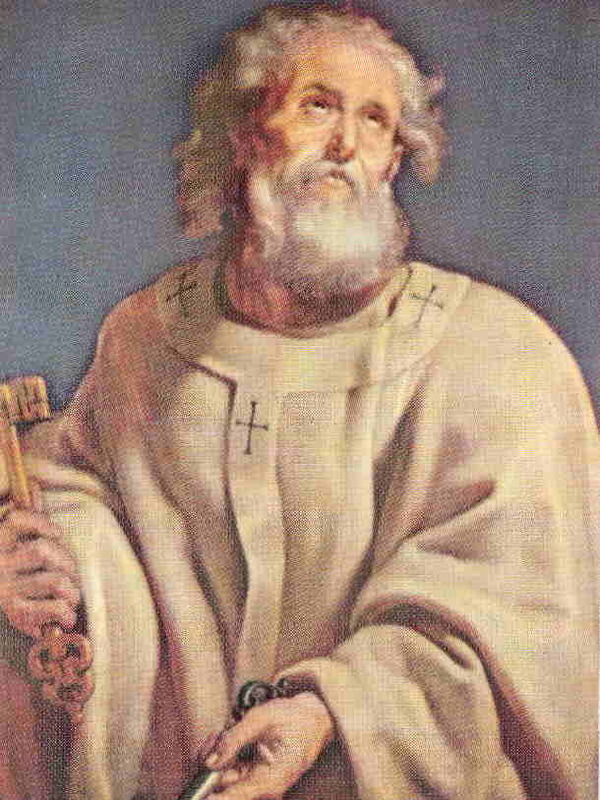 O glorious Saint Peter, who, in return for thy lively and generous faith, thy profound and sincere humility, and thy burning love, wast honored by Jesus Christ with singular privileges, and, in particular, with the leadership of the other Apostles and the primacy of the whole Church, of which thou wast made the foundation stone, do thou obtain for us the grace of a lively faith, that shall not fear to profess itself, openly, in its entirety and in all of its manifestations, even to the shedding of blood, if occasion should demand it, and to the sacrifice of life itself in preference to surrender. Obtain for us likewise, a sincere loyalty to our holy mother, the Church; grant that we may ever remain most closely and sincerely united to the Roman Pontiff, who is the heir of thy faith and of thy authority, the one, true, visible Head of the Catholic Church, that mystic ark outside which there is no salvation. Grant, moreover, that we may follow, in all humility and meekness, her teaching and her counsels, and may be obedient to all her precepts, in order to be able here on earth to enjoy a peace that is sure and undisturbed, and to attain one day in heaven to everlasting happiness. Amen. O God, who hast given unto Thy blessed Apostle Peter the keys of the kingdom of heaven, and the power to bind and loose: grant that we may be delivered, through the help of his intercession, from the bonds of all our sins: who livest and reignest world without end. Amen. Indulgence of 500 days; plenary indulgence once a month, on the usual conditions, if these prayers are repeated daily with devout sentiments. Thank you, St. Peter for you intercession. Thank you Heavenly Father.